The once and future residence of the Jemane family was overrun by ogres years ago. 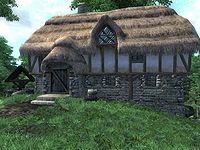 Upon visiting Weatherleah, and before speaking with Guilbert Jemane to begin the Legacy Lost quest, the house is in very poor condition. The typical farm house has been ransacked. A small room to the right of the front door, possibly a small study or dining room at one time, has overturned bookshelf, tables, chairs and clutter strewn about. A charred body remains in the pass-through fireplace. The debris, as well as the bones left behind on the main floor, are evidence of a violent event or less-than-human occupancy. Upstairs are two bedrooms. The first containing only clutter. The second has a single bed, a cupboard with groceries and a bottle of Tamika's West Weald wine sits upon a small table in the corner. A skeleton lies at the foot of the stairs up to the attic area. The third floor attic area holds only human remains. Numerous skulls and a skeleton again indicate acts of depravity; not surprising considering the cannibalistic tendencies of ogres. This page was last modified on 8 July 2018, at 13:03.